I have a special friend who was 60 last week. Unfortunately we didn't make it to her Birthday bash. This is the card I had made for her I'm really sorry it didn't arrive on the day. 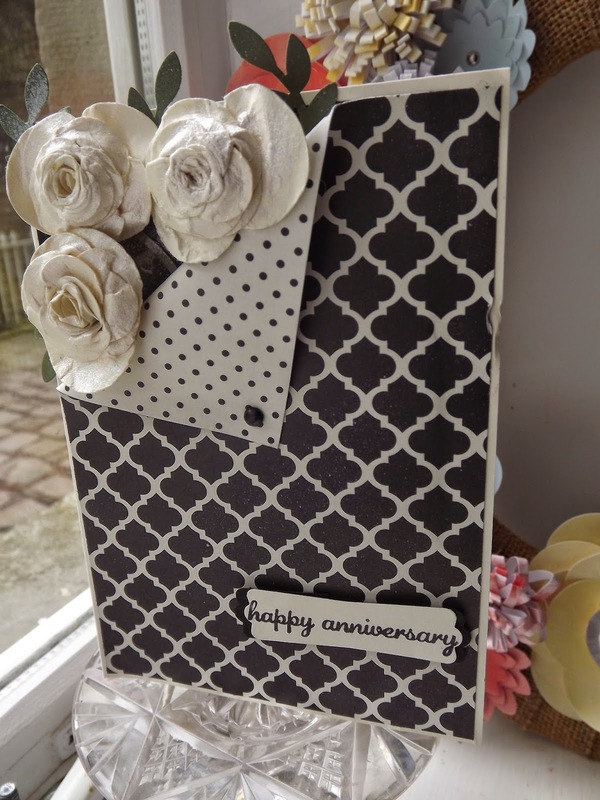 She had said she loved the black and cream card with the spiral flowers so this is a make on that theme. I also made a box for it to go in as the flowers stand quite proud of the card. So glad she had a great do and I wish her every happiness in the coming year. 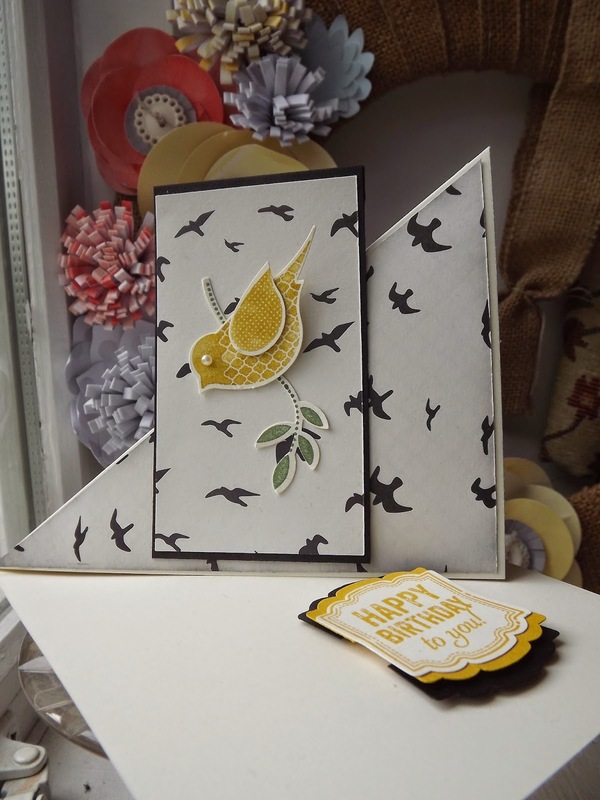 Here we have 3 cards all using the wetlands stamp and stampin' up! markers for a watercolour effect. This is the 'make and take' card for parties booked this month. Get in touch to book yours. Which is your favourite colour combination. I have lots of sentiments for your friends to choose from to add to their card. Ring me on 01422 648722 to book your party. Another card from training. Again using the large chevron stamp. The focus this time is the moving car. The tag top punch was used to make a tag, sticking out from the side of the card, when pulled the birthday message appears. I remember these when you put a penny behind the car then you tilted the card and the car would move, or something like that. Do you remember those? This card was made at training last month. 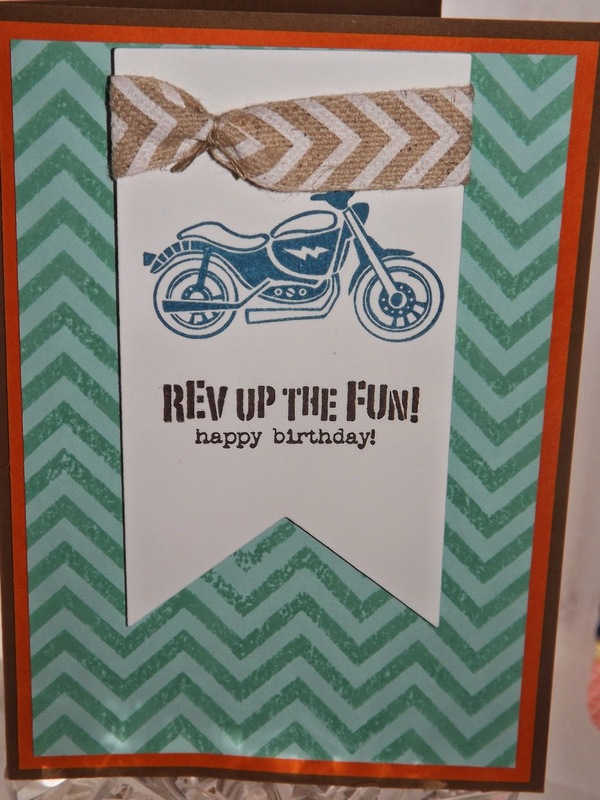 It makes great use of the new large chevron background stamp, here stamped in coastal cabana. The white card is die cut with one of the new pennant dies. The ribbon makes a good combination with the chevron stamp. Cards for men are so much harder but this fits the bill so well, good for the young and not so young! This card was inspired by Francis Martin, an American demonstrator whose blog I follow. The polka dot pieces is also a new stamp set. The crushed curry was still out from yesterday so I stamped the birdie in that then used the punch. The paper is another sheet from Modern Medley. It just has such a light floaty air. The first picture shows the card closed, the second the card open. 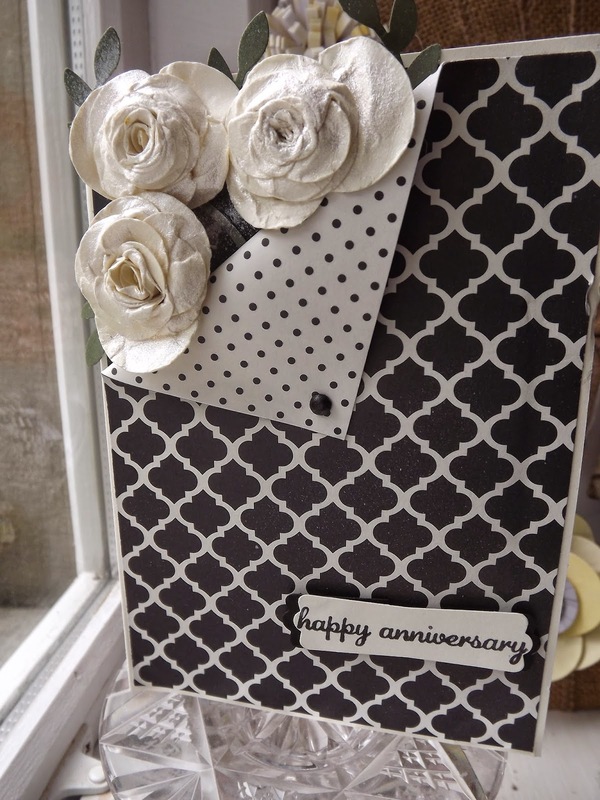 The sentiment - love labels - is used with dimensionals to make the card stand up as it sits behind the sentiment. This would make a lovely card for many occasions. A bit of bling. A new stamp set which included the very on trend ampersand. 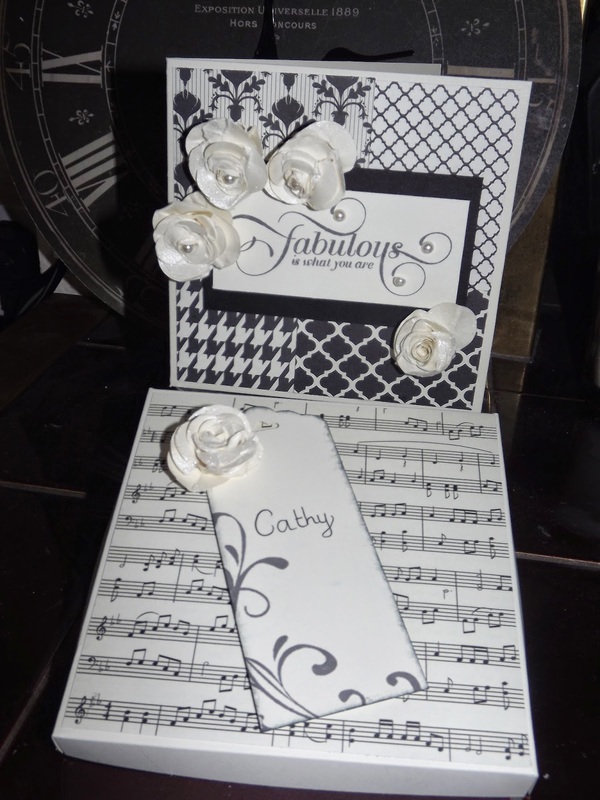 I have used the oval dies both on the front and the inside for the white card. The flowers use the spiral flower die and the scalloped circle punches in all sizes, then I have sprinkled with the gold sequins. The flower card and ink is actually Crushed Curry, but I think it looks good with the gold sequins. I think you can tell I love this spiral flower die. You will see a lot of it over the coming months. I found this card on Pintrest (Found on susanstamps.wordpress.com) and just had to have a go. I even ordered the smooch spritz.... it arrived after I had completed the card but I used it anyway to give the flowers a little shine. The papers are modern medley which I will be sad to see go at the end of the current catalogue but I'm sure we will have something just as lovely to replace them in the new catalogue coming on July 1st.